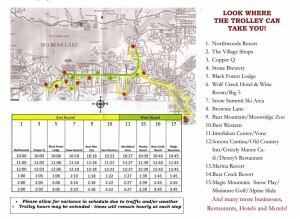 Have you seen the happy trolley driving around Big Bear Lake? I see it pass my office window a few times per day every weekend, it is a great way to get around in Big Bear Lake. For $5 per guest you may use the trolley to get around from 10 a.m. – 4 p.m. on Saturdays and Sundays and if it is a 3 day holiday weekend, you get Monday as well. Children 6 and under are free and seniors and disabled riders are just $2.50. The trolley is wheelchair accessible and you can even get on with your skis/snowboard and they will take you to the resorts. No fighting the traffic and paying for parking there. 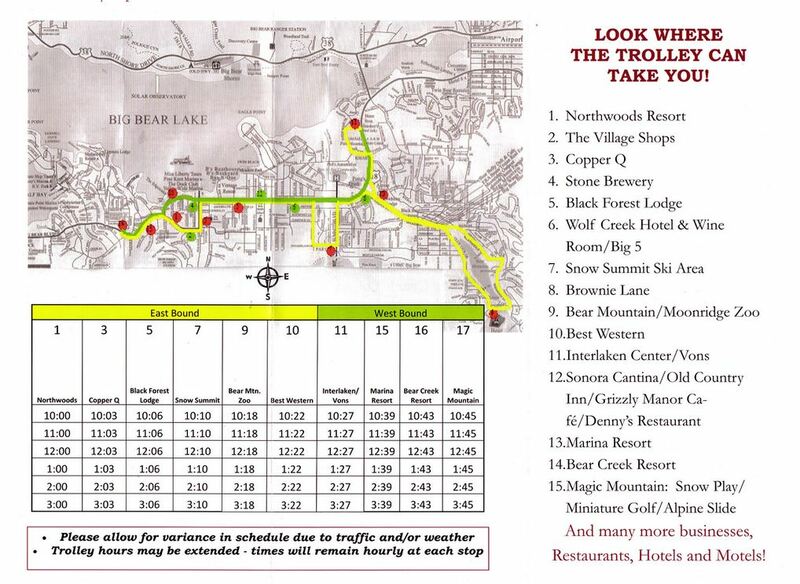 There are many stops where you may hop on or hop off the Big Bear Lake Trolley. This map shows time schedule and trolley stops. All Aboard!